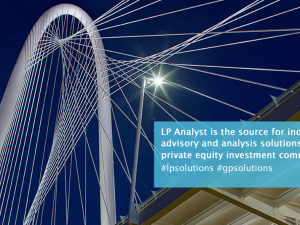 LP Analyst provides private equity limited partners with best-in-class, non-discretionary, independent advice and analysis. LP Analyst specializes in private equity 1) fund due diligence, 2) fund and portfolio monitoring, 3) portfolio evaluation and 4) fund and direct valuation. LP Analyst provides in-house teams with a more cost-effective alternative to traditional consultants. DALLAS, June 26, 2012 — LPA Management, LLC today announces the launch of LP Analyst, an innovative consulting firm providing private equity limited partners with best-in-class, non-discretionary, independent advice and analysis. LP Analyst’s private equity 1) fund due diligence, 2) fund and portfolio and 3) portfolio solutions all reflect industry best practice and provide leverage for organizations that lack the time, resources or systems required to efficiently produce advanced analysis in-house. In addition to its more traditional solutions, LP Analyst offers specialist advice in the form of its private equity fund and direct valuation services, which provide independent third-party support for secondary buy-side and sell-side decisions and other transfers. LP Analyst’s solutions integrate seamlessly with a client’s existing processes, allowing for increased focus on higher value-add activities like overall program management, GP relationship development and LP networking. More specifically, LP Analyst enables clients to 1) evaluate opportunities more thoroughly and efficiently, 2) actively monitor developments and manage risk, 3) improve cash flow forecasting and budgeting, 4) maintain investment policy compliance and 5) make better-informed active portfolio management decisions. And unlike traditional consultants, all of the firm’s solutions are offered on a standalone or subscription basis, ensuring LP Analyst clients do not overpay for phantom services or unnecessary hand holding.